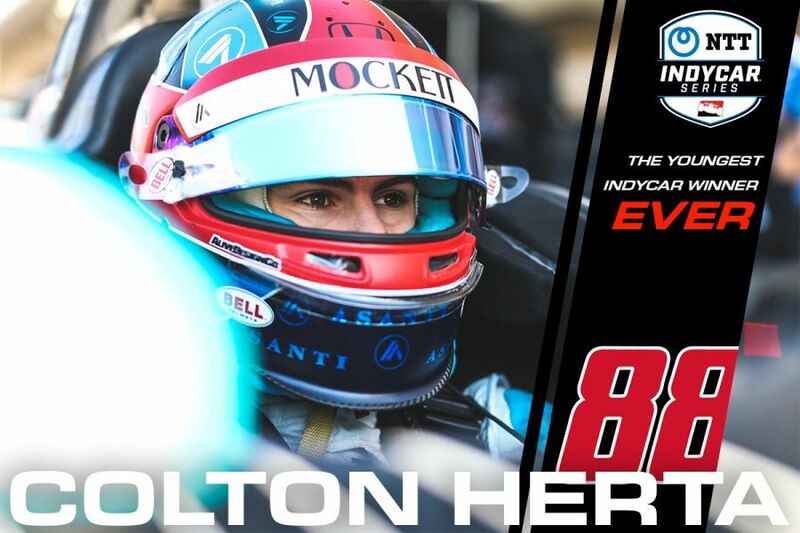 Colton Herta becomes the youngest ever IndyCar Series race winner today by winning the IndyCar Classic at the Circuit of the Americas, aged 18 years, 11 months and 25 days. The driver of the #88 Harding Steinbrenner Honda scored his maiden IndyCar victory in his only third start in the premier North American open-wheel championship. The previous youngest race winner was Graham Rahal, who was 19 years, 3 months, 2 days when he won at St. Petersburg in 2008. Herta started the race fourth on the grid and made progress to P2, behind the pole sitter Will Power. Then Alexander Rossi overtook him and got in a fight against Power. Behind the leading duo, Colton Herta made his final pitstop just before a caution interrupted the race, caused by Felix Rosenqvist’s crash. During the caution period Rossi was forced to drop down the order, while Power retired after stalling his car when trying to pull out of his pit box. That promoted Herta to P1. At the restart, with ten laps to go, Herta defended his lead ahead of Josef Newgarden (Team Penske) and stayed in front until the end of the race, crossing the finish line 2.7812 seconds ahead of Newgarden. Ryan Hunter-Reay (Andretti Autosport) completed a podium. Graham Rahal was fourth, in front of Sebastien Bourdais, who moved up 12 spots from his starting position to place fifth. Marco Andretti made even better progress, advancing 14 positions to finish sixth. Takuma Sato, Patricio O’Ward, Alexander Rossi and Jack Harvey completed the top 10. The next IndyCar Series race is the Honda Indy Grand Prix of Alabama at Barber Motorsports Park on Sunday, April 7.